Cao Van Tue is witness to the dramatic and life-changing impacts of climate change. With an entire lifetime of 62 years spent living in Binh Dao, a small coastal community in central Vietnam, the last decade has been like no other. “Everything has changed. Before we had predictable seasons and a few storms a year. Now we have many storms, [yet] long dry spells,” says Tue, who is dependent on agriculture to make ends meet. 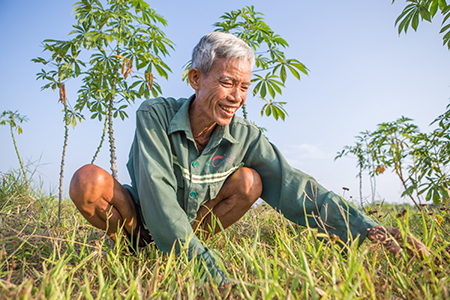 His family, like many in Quang Nam province, has had its livelihood and income threatened by dramatic swings between severe drought and extreme flooding, resulting in crop failures and 30% reductions in rice and peanut yields—even making some livestock no longer viable. The reduced income not only means less to spend on medicine for Tue’s wife Bui Thi Lien—it also affects their already meager meal sizes, at times forcing family members to skip meals. Vietnam is the world’s fifth most vulnerable country to climate change according to the Global Climate Risk Index 2018. Recognizing that challenges will only intensify, Catholic Relief Services is helping safeguard rural livelihoods by helping families such as Tue’s build resilience to natural hazards. 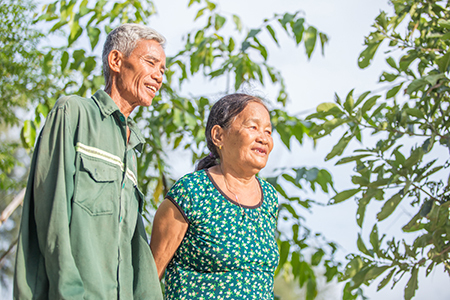 CRS’ 18-month disaster risk reduction project in Vietnam serves seven disaster-prone communities and teaches farmers to prepare for, respond to and recover from natural disasters. The project also includes climate change adaptation measures to reduce loss of life and property from extreme weather. CRS has worked in the Quang Nam province since 2005 and is a committed development partner in Vietnam. Using applied risk assessment guidelines approved by the Ministry of Agriculture and Rural Development, CRS consults communities on their risks, and works with them to identify causes, needs and solutions. To protect farmer’s livelihoods and help them become sustainable, CRS introduced a range of climate change resilience measures. Water conservation techniques during periods of drought, realigning harvests with seasonal fluctuations, and adding cash crops such as green beans and peanuts to ease dependence on vulnerable paddy crops have been successful. For Tue, the application of a new composting technique has delivered dramatic results—a 30% increase in peanut harvest yields in just one year. Layering manure and leaves keeps moisture in the soil during dry spells. 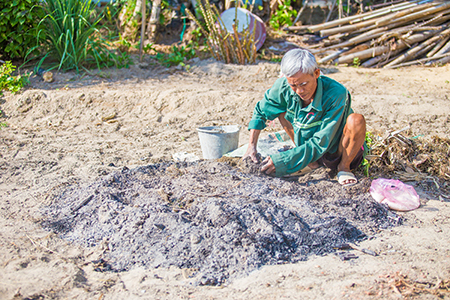 Farmers used the same technique with crops such as cassava and rice with equally impressive returns. 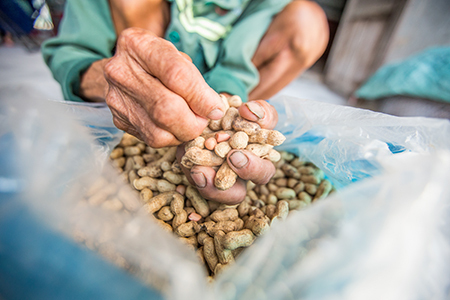 Vo Hoang Luan, another area farmer, reported his peanut crop now “required less labor, but would bring 50 or even 70% more revenue” than the previous season. He encourages his neighbors to adopt this CRS-championed technique. Tue says his sharp increase in yields means “we now know we can always have money to buy medicine” and not compromise the family’s health. Training for Tue, Luan and 300 other farmers was integrated into the regular village meetings with information, education and communication materials developed by CRS. A key ingredient in the project’s success is its grassroots engagement to identify risks and deliver solutions to protect rural livelihoods, shelter and other aspects of everyday life threatened by climate shocks. Technical support groups of volunteer members from community organizations, in cooperation with the national community-based disaster risk reduction program, work with each community to identify needs, specific solutions and implement the risk reduction plans. Vo Tan Sanh, a group member and chairman of the community-level Red Cross—and who played a key role in delivering the livelihood protection training in Tue’s village—says the model has significant potential to be replicated further in the province, with 200 farmers from non-project communities already benefitted from training. “Normally, farmers practice traditional techniques and don’t know how to protect their livelihoods from climate change. Now other communities are interested in learning [from us],” says Sanh. 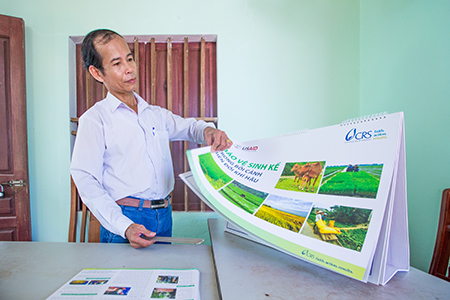 This cost- and time-effective approach is also evident in the few days’ training Sanh received from CRS before he entered the field to work with more than 550 farmers over the past two years. Overall, the project prepared 3,511 direct and 54,464 indirect beneficiaries to respond to the growing challenges of climate change, with 2,930 local people helping to develop 47 community-based disaster risk reduction plans implemented at village level. “The climate resilience techniques introduced by CRS are not only contextualized and applicable for the local community and natural hazards they face, they reflect local cultural practices and financial capacity,” says Nguyen Thi, CRS Vietnam disaster risk reduction program manager. During the second phase of the project, CRS will take an innovative approach to climate-resilient agriculture to “bring together policy-makers, scientists, extension workers, farmer cooperatives and the community to work on a portfolio of practices on customized agro-climate forecasting and information systems so farmers can adapt crops to reduce losses and increase yields,” says Thi.